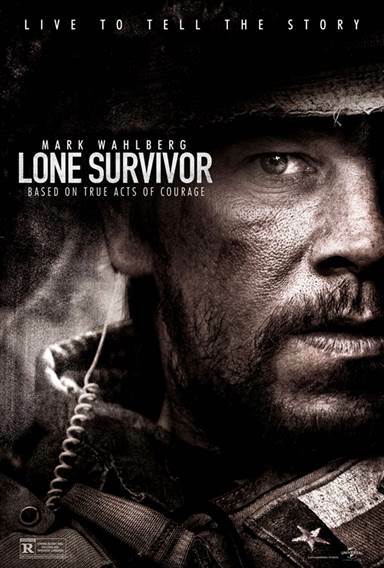 Download Lone Survivor in Digital HD from the iTunes store. Lone Survivor images are © Universal Pictures. All Rights Reserved. A startling true story reaches theaters this weekend and it's very realistic. Lone Survivor takes the viewer on an ‘edge of your seat' trip into Afghanistan with a Navy Seals squad. It's not a documentary, but a gut wrenching drama that shows the brutal fighting that goes on in a country in turmoil. Extremely well acted, directed and with cringing cinematography the film's a shocking war on terror story. If you can take a lot of nervous tension and combat violence, put yourself in a seat at a local theater for this aggressive true story. The movie opens with Navy Seals training and how tough a candidate has to be to survive boot camp. You can see the strain on their faces and the despair of the dropouts who have to lay their helmets in a row with others when they fail. Only the cream of the crop survives to become a Navy Seal. The story shifts to Bognam Air Base in Afghanistan where a company of Navy personal is setting up Operation Red Wing with a mission to take out al-Qaeda Taliban leader Ahmad Shahd. The Navy Seals are itching to get into this fight, especially since Shahd is responsible for killing 20 U.S. Marines a week earlier. The attack forces are broken into squads and airlifted to several drop points deep within Taliban territory. Spartan 01 squad consisting of Lt. Michael Murphy (Taylor Kitsch) a sniper, Hospital Corpsman 2nd Class Marcus Luttrell (Mark Wahlberg) a sniper, Sonar Technician 2nd Class Matt "Axe" Axelson (Ben Foster) and Radio Operator Danny Dietz (Emile Hirsch). Safely dropped onto a good observation point high on the side of a mountain, the group lay in waiting for Shahd to make an appearance in the small shanty hut village far below. When the squad gets discovered by some goat herders they have to make a decision on whether they should kill them, tie them up or just let them go hoping they will not warn the occupants of the village below. Writer and director Peter Berg sets up the situation very nicely than pulls the chain that causes all hell to break loose. Using facts from the New York Times best selling true story, he takes the audience into the midst of a firefight between a throng of Taliban soldiers against just four Navy Seals. From the moment the first shot is fired to the gut wrenching final chapter its non-stop mayhem. Excellent cinematography, special effects sound, choreography and multiple cameras create a blood bath. The standoff by the brave Navy Seals, with their backs to the wall, shows their relentless determination to stand their ground against the hoard of Taliban. Shot on the side of a mountain, director Berg perilously takes his cameras in close on some of the most dangerous ledges to get just the right angles for realism. His actors are magnificent working their characters as if they have gone through Navy Seal boot camp themselves. Leading the squad as Lt. Michael Murphy, Taylor Kitsch makes his character exude bravery. His main weapon is a sniper rifle. He's the main contact with the mission leader Lieutenant Commander Erik S. Kristensen (Eric Bana) who runs Operation Red Wing base headquarters. His second in squad command and right hand man Marcus Luttrell played by Mark Wahlberg letting loose with the tough persona and attitude we saw in The Fighter. He also carries a sniper rifle and his duty is to take out Shahd if given the order to do so. The other two members of the squad are characterized aptly by Emile Hirsch communications experts Danny Dietz and Ben Foster as Matt Axelson. Both are up for the battle, especially Axelson who fights like a cornered wolf never backing down no matter how much hot led has penetrated his body. With a strong cast showing realistic characters, fine direction by Peter Berg (Battleship, Hancock, The Kingdom), an excellent crew and a heartrending true story provides one of the best films for 2013. Lone Survivor has all the elements, but is not perfect. Most people will not know of this mission and its results, so why announce in the title that there is one survivor? Better still, why show the survivor in the very beginning so they know which one survives? Using the unknown would have had a greater impact on the viewer in my opinion. Lone Survivor has been rated R by the MPAA for strong bloody war violence and pervasive language. Be cautious when deciding to allow immature children see the film as there are some very shocking realistic scenes of killing. No matter how much it hurts, how dark it gets or how far you fall .... you are never out of the fight. Read this book. Cannot wait.